Colder weather means that you need warmer Greek apparel! We have just what you need to rep your letters all season long while still staying warm and cozy. Here are our top 3 must-have fall items from Greek Gear! Custom twill long tee: We love these long sleeved tees! You can choose the shirt color, letter color, and even a pattern for the twill- truly making this your very own custom Greek lettered tee! These tees are super preppy and classy. Pair this lovely long-sleeved tee with leggings and boots and you have a cute, comfy ensemble for fall! Custom twill crewneck sweatshirt: These sweatshirts are totally in right now. 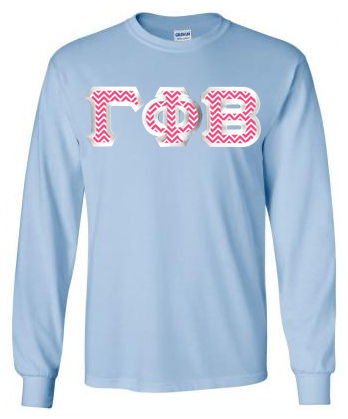 Just like the long sleeved tee, these crewnecks come in a variety of colors and the letters are customizable. Do you love sparkels? Animal print? Chevron? We have all of these patterns of twill and SO many more, which means that you can rock your letters in style. 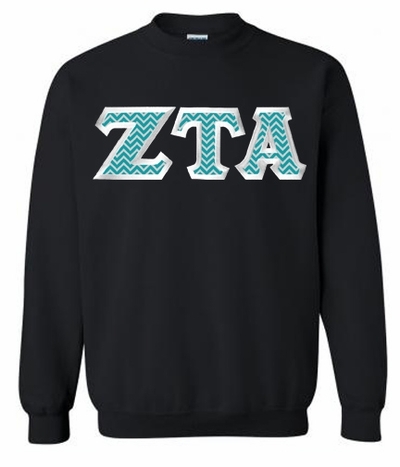 These sweet sweatshirts are perfect attire for any group events that your sorority will be hosting this fall/winter season.